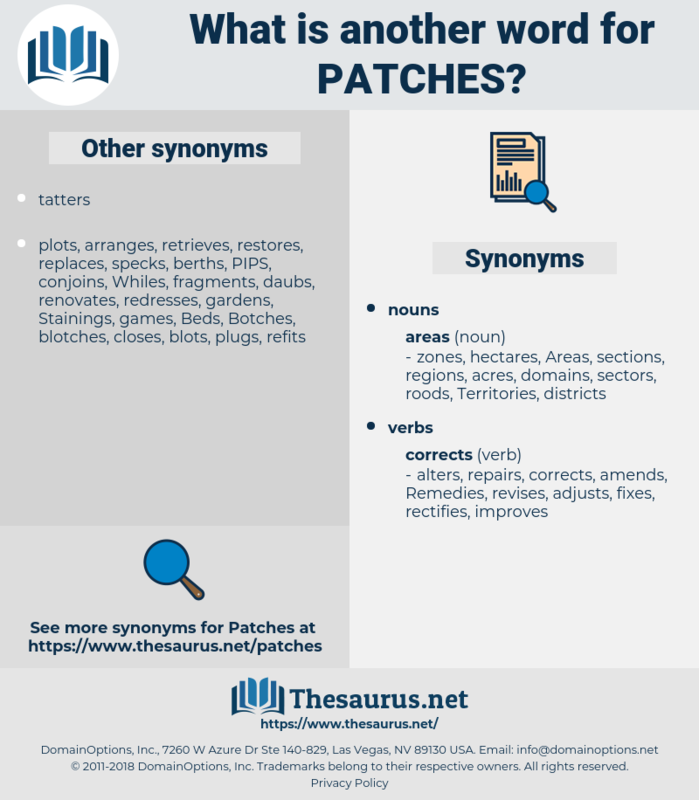 What is another word for Patches? blotches, parts, stretches, chapters, packages, batches, threads, pads, spots, credentials, modifications, Beaches, packs, Branches, battlegroups, neighbourhoods, Associations, occasions, pockets, denominations, landholdings, surfaces, check-ups, locations, topics, heaps, crests, plantings, assignments, acres, tranches, merchandisers, CAMPS, acreages, panels, localities, embankments, quarters, repairs, Stains, species, steppings, downstairs, inspections, swathes, checkups, reaches, woodlots, motherfuckers, fractions, allotments, thickets, habitations, Dependencies, remnants, substrates, Benches, clusters, segments, stockings, aggregations, WEBSITES, instalments, subsections, documents, times, TUFTS, scutes, headings, placards, changes, Tracks, spheres, badges, alterations, stops, Blemishes, brackets, glasses, fragments, Schools, coalitions, tussocks, scans, districts, sections, subdivisions, groupings, dots, amendments, seats, consortiums, platoons, legs, wings, examinations, vouchers, forecasts, Selections, shields, Areas, layers, fields, SHOALS, plates, Locales, lots, spillages, rings, Clumps, departures, lengths, cartons, cays, belts, sheets, stocks, markings, plots, assemblages, speckles, horizons, bits, settlers, tags, hallmarks, divisions, places, themes, Rookeries, tiles, sites, boards, regions, exhibits, groves, markers, groups, squares, sectors, tasks, edits, Pleadings, shores, pits, blots, logos, Colonies, holdings, bouquets, stars, chunks, islets, bars, LUMPS, frames, smears, SOCKS, grand, marks, Remedies, PODS, SPARES, Islands, Duties, aquifers, tables, pews, AMAS, aliquots, smudges, slots, Moieties, offerings, Plays, servings, bands, spans, routes, Coins, grounds, lands, stands, blocks, GRIDS, moments, zones, releases, Prawns, spills, pools, arrays, roosts, reefs, BLOBS, webs, bucks, slabs, Ones, wards, tune-ups, sides, bunches, rooms, boulders, Keys, desks, piles, units, sizes, bundles, towns, swarms, stools, drifts, subjects, ranges, linens, wedges, slicks, Bodies, Bas, banks, masses, venues, blocs, Beds, slides, nappes, bluffs, Floors, bells, signs, mounds, low, LOWS, Downs, Adjustments. The moon was concealed, but there were patches of dim stars. 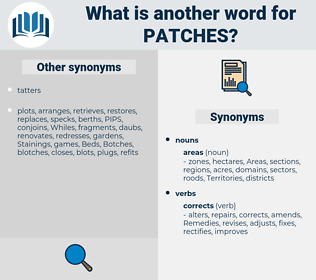 The latter was a good deal faded, of course, but it would not matter much if the patches showed a little.